Adding more memory, or RAM, is the best thing you can do for your PC. More memory provides an instant boost to the system. Adding memory to your computer is simple. However, adding memory isn’t something to be taken lightly. Unless you’re comfortable upgrading your PC, consider having a computer expert or repairman do the work for you. 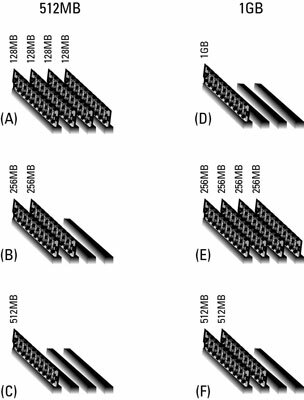 Various memory upgrade configurations are shown in the following figure. Add memory to upgrade your PC. Check to see how the memory is handled on the motherboard. Determine how many memory banks, or DIMM slots, the motherboard has and the maximum memory capacity. Determine how your PC’s current memory is configured. Visit an interactive Web site that asks you questions and then provides memory solutions tailored to your PC. Crucial is an excellent resource.